Storage has always been an issue for me, especially when I was setting up my small starter apartment. 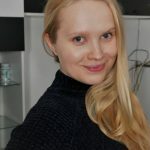 I just had too many things, and when I had moved in completely, I barely had any place to lie down. It’s true that we will never really have enough space. But it’s so much harder if you are sharing an apartment, or only have a small room to store your essentials. 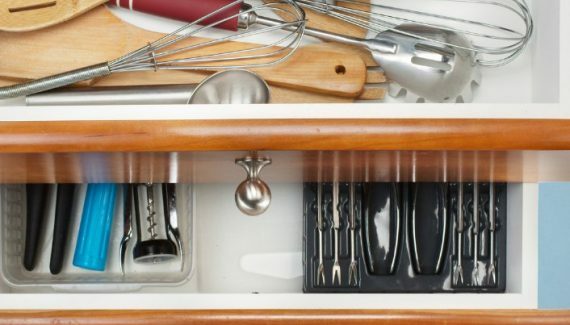 But there are always ways to de-clutter your life and organize with smarter and stylish storage. 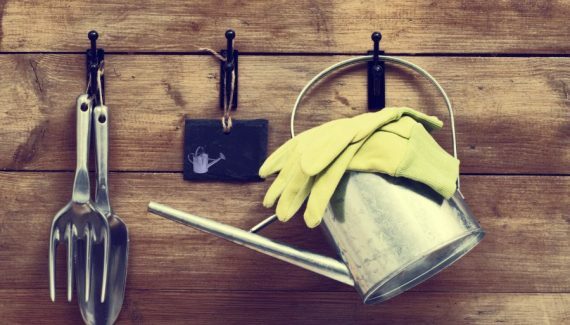 These cute storage hacks will sort out your decor too. Use the crown moldings on your wall to store your heels. 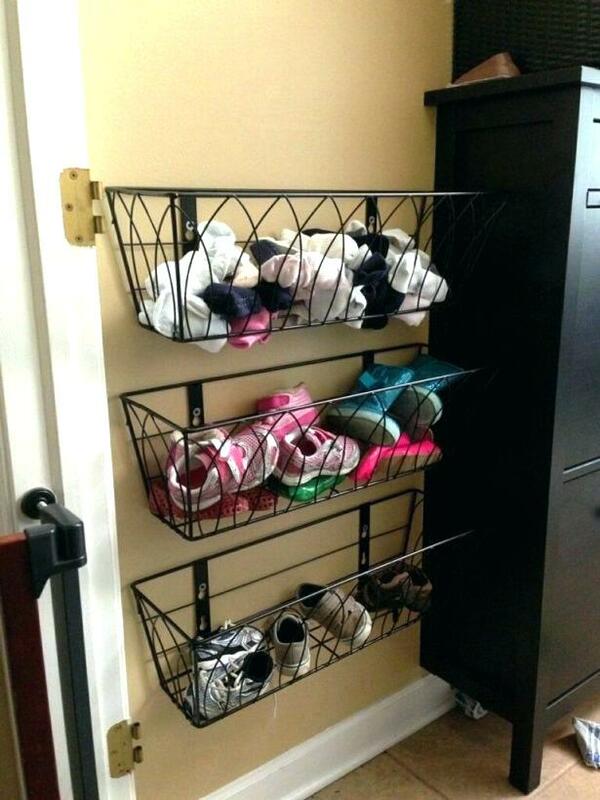 I’m always looking for spaces where I can stash my shoes, so that they don’t crinkle, and using wall space is a good idea. The crown molding provides a fantastic solution. It also looks like a statement arrangement and gives a quirky look to your room. If you have too many shoes, and your shoe closet’s full, just go to your nearest Home Depot and buy a few crown moldings. Attach them with glue to your walls, and just use it to store your shoes! Pegboards make for great organizers. Thus, they can definitely help you to sort out your essentials. Just get a pegboard from here (comes in multiple colors) and some hooks. 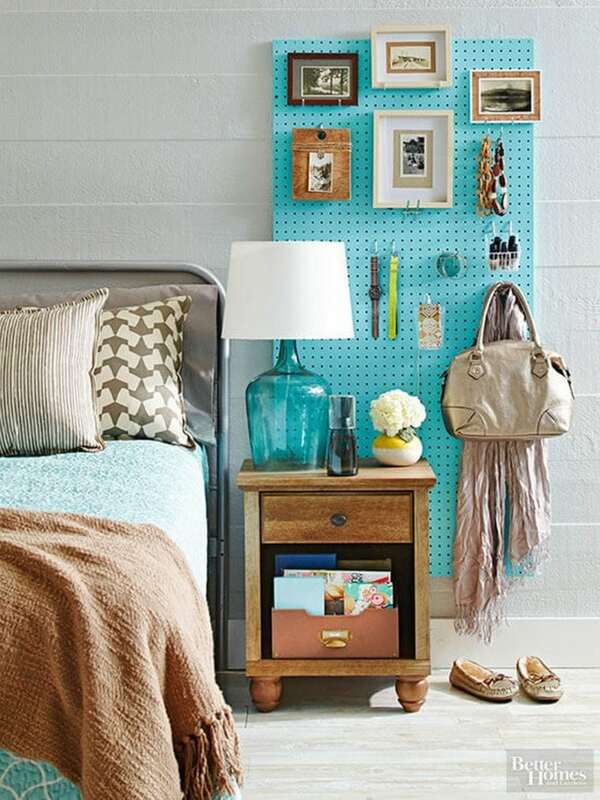 You can also paint the pegboard to match your room décor. Use the hooks to hang bags, jackets, scarves, jewelry or even photos. In fact, you can use the pegboard to hang the clothes for the next day, as it totally works as a mood board too. Shelves will always be your friend when it comes to saving space. Just add floating shelves wherever you find an empty corner on the walls. You could arrange them in a way so that it looks cute and simple. This is exactly the place where you want to put your favorite pictures and souvenirs from abroad. Adding a bench to your bedroom will add a chic vibe to it. 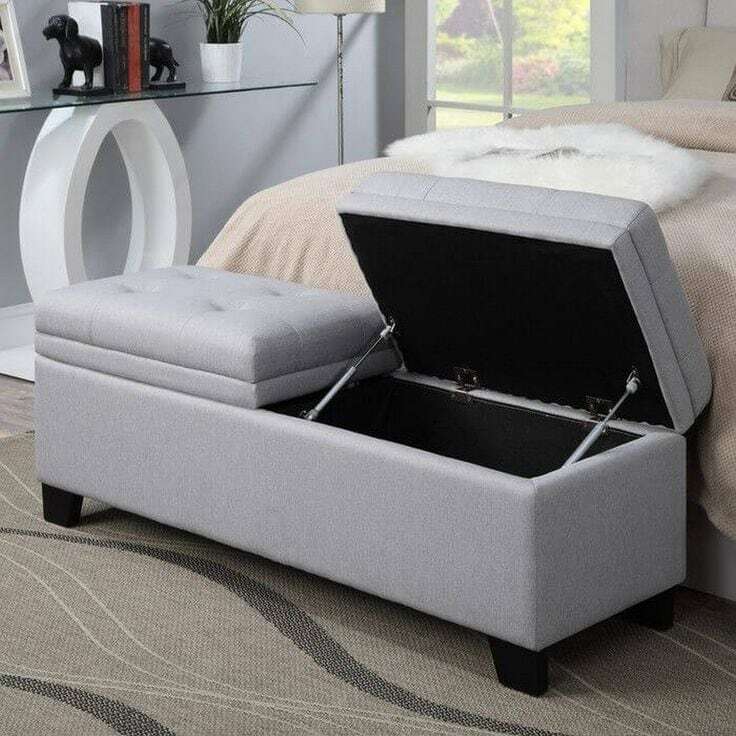 However, if you opt for a storage box bench seat, you can use it for storage too. Place it where your bed ends. Choose muted colored covers so they sync with the color of your bed sheets. Invest in a cute vintage suitcase. 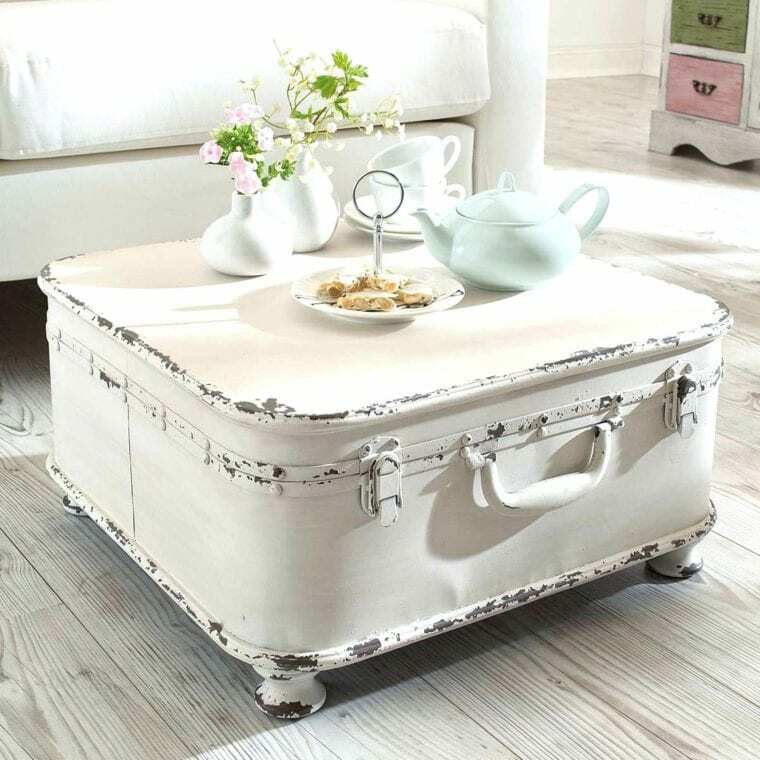 It can provide you with very much needed storage space as well as act as a coffee table. Whenever you have friends over, get it out from under the bed and have the best time of your life. At other times, just leave it another the bed and store all of your essentials. I’m sure all you book lovers have a ton of books and no space for them! 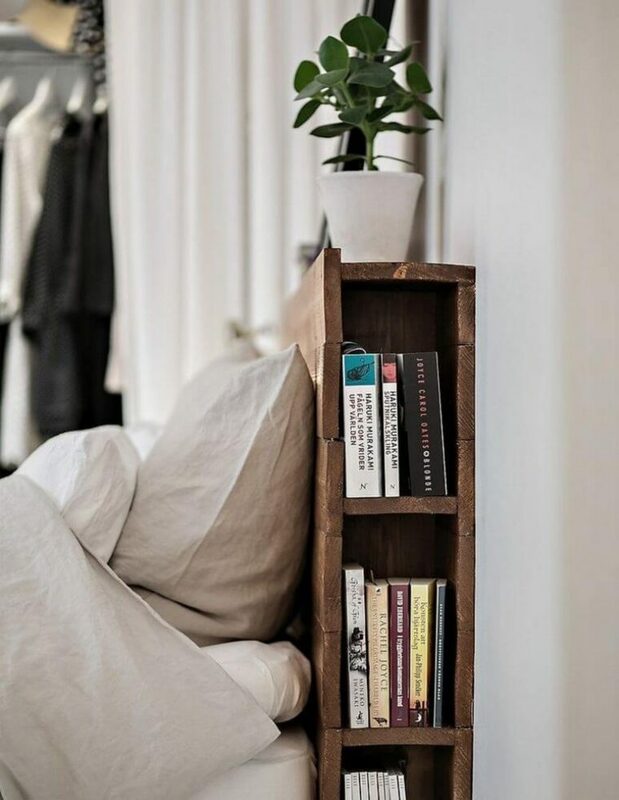 Making your own bookshelf inside the bed frame can be super handy. 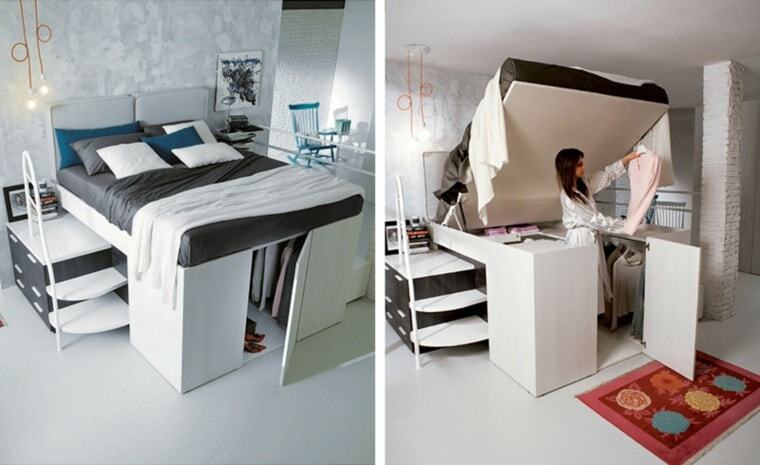 If your bed does not have a built-in shelf like that, just buy one separately and attach it. The idea here is to not let the side space go to waste. 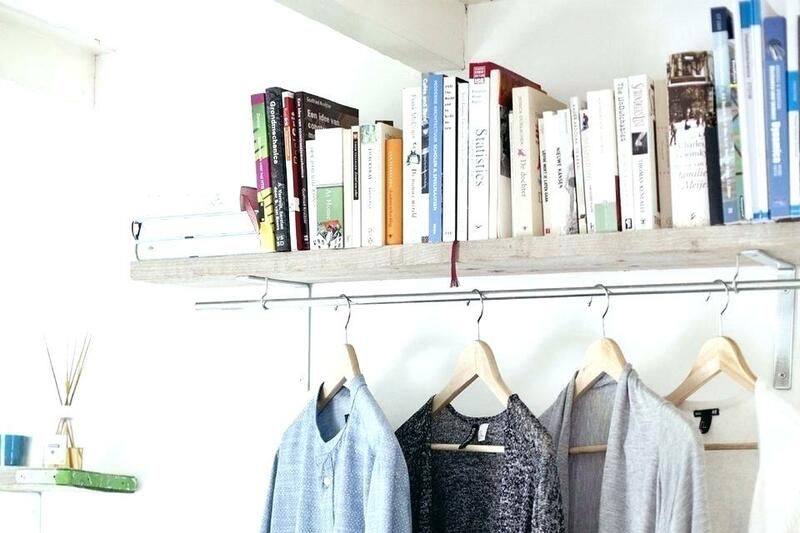 Get a narrow bookshelf like this one to make it happen. Trust me, you won’t regret it! 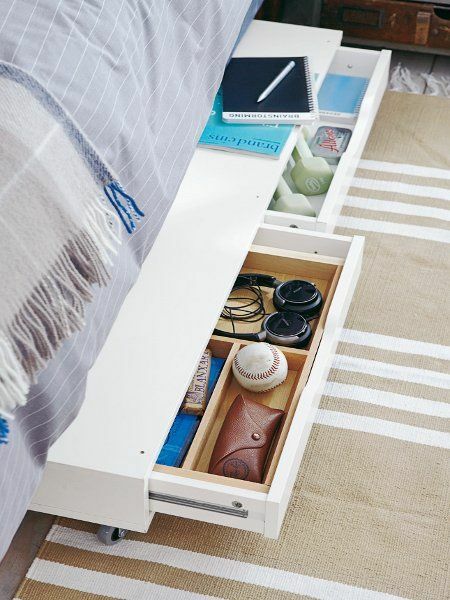 In case the space under your bed is too narrow, invest in a shelf storage organizer like this one here. Ask someone handy to attach the wheels to it. They are usually meant to be used as wall drawers, but can totally go under the bed, and are incredibly stylish to look at. They have very helpful compartments which can categorize your belongings easily. Also, you could just buy an under bed wood storage with wheels here or these white storage boxes that are plastic. 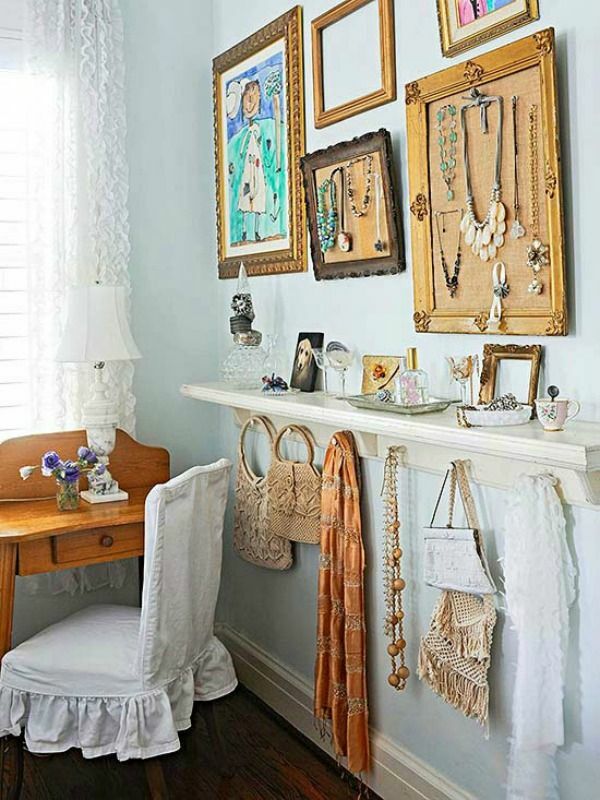 Instead of hanging up traditional wall art, hang your boho jewelry, vintage accessories, scarves, and clutches from bulletin boards on your picture frames. You can set up four or five of these frames. They’ll give you some extra space to store the small jewelry items. You could get a frame in the Dollar Store and organize a lot more than your accessories. I know yoga mats belong on the floor but when you roll them up, they take quite a bit of space. Also, unrolling them can be so frustrating. Here is an interesting product that helps you to hang the yoga mats flat on the wall. So, they never curl up, you can just start doing your yoga routine and clip the mats on the wall. Easy and saves loads of space! This is a genius idea I’ve just found online. If you have a radiator, you know that these take up quite a bit of space sometimes. Also, they’re of awkward shape, so you cannot use the radiator itself to store anything. 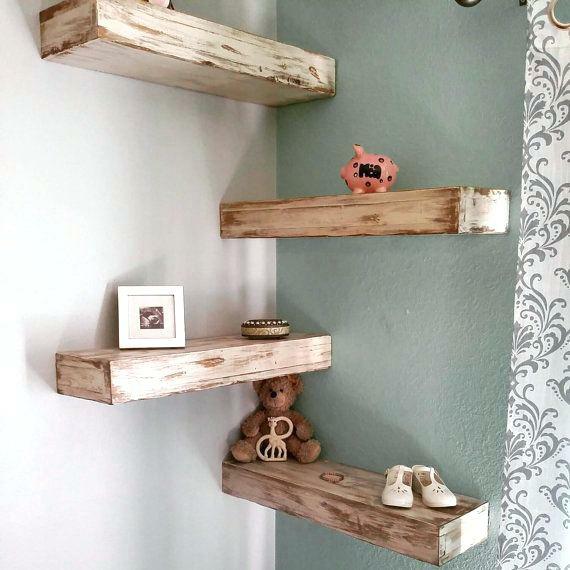 Build your own shelving around it! 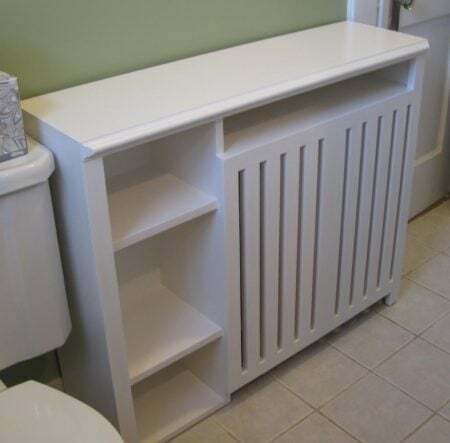 You’ll have some space for the towels, soaps, shampoos, etc. Just make sure that the products can resist the heat. Wall metal wire baskets are the best for small spaces. You can use these to store shoes, bags, accessories and anything else. Books even! Just make sure the basket doesn’t get too heavy. Otherwise, you might ruin your walls. Here are some the wall baskets I recommend: option 1, option 2, option 3. Choose the design that suits your space best. Baskets are great for organizing beauty products. Now, this is not the best idea for someone who doesn’t like heights or tight spaces. However, it’s pretty great. Ask someone to install metal stands/wooden stands to lift your bed up. You’ll realize that all of the sudden you’ll have all of that vertical space to store books, clothes and much more! Make sure whoever is helping you out with this one, knows what they’re doing! You wouldn’t want to fall down during the night. Get a spice rack like this one here and take your bedroom to a whole new level! Just kidding. 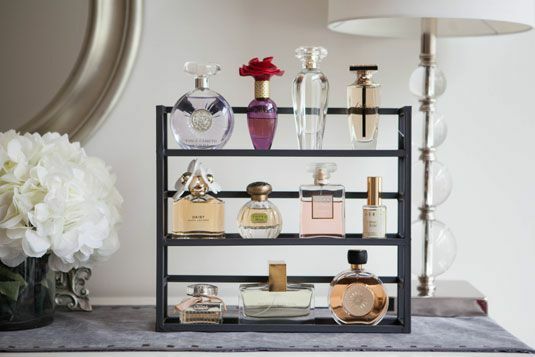 You can use it to store your perfume and other beauty products. It won’t take a lot of your horizontal space but use the vertical one instead. 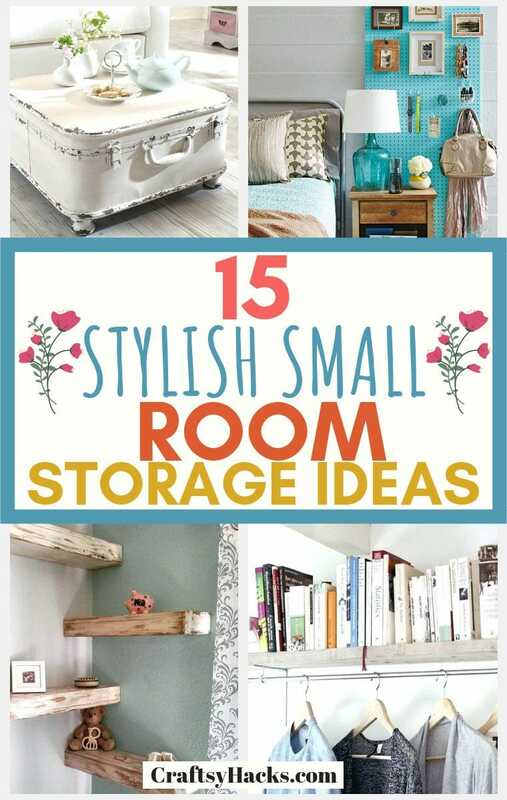 Simply a great and cheap way to increase storage room in your small bedroom! Often, we don’t realize how much vertical space we have underneath those floating shelves. Install a metal tube and use it to hang your clothes. However, make sure they don’t get too heavy. Otherwise, the shelf might fall down. Other than that, it’s a great way to store clothes that you regularly use. If you live in a small space, it doesn’t mean you cannot work out in it. 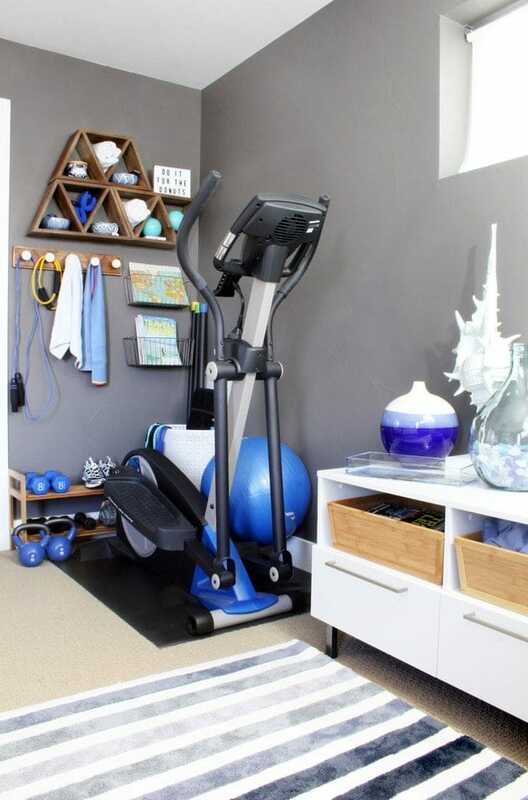 Use your corners to store all workout tools and equipment. Shoe racks can be used for dumbbells, wall racks for little bits and bobs. Feel free to even attach vintage hanging wire metal baskets like these ones here. These can store a lot more goodies and look amazing.